Old Maid turned wife and mother. What a difference a week makes. Pants that I wore a week ago are now too tight. 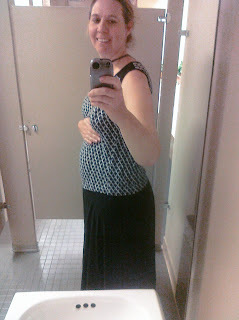 My fat pants are getting snug and my belly is rounder and firmer. 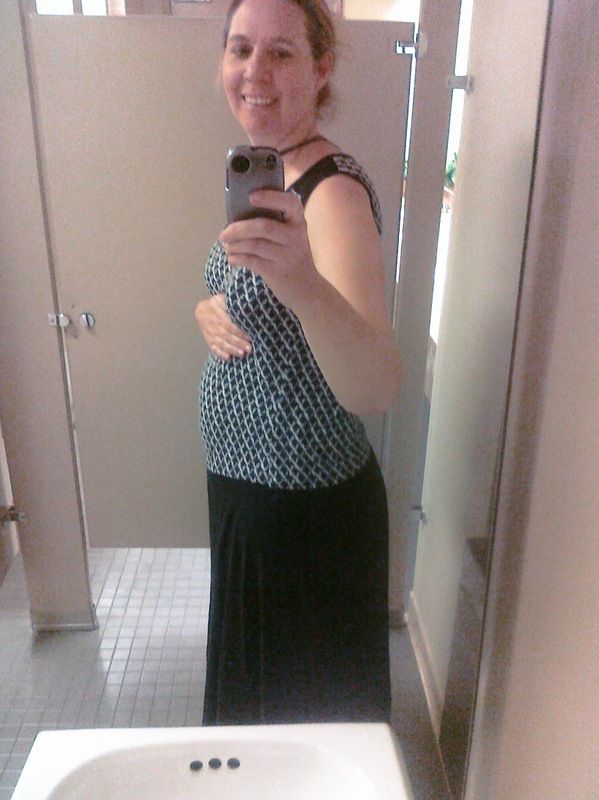 I was hoping to be able to make it to about 18 weeks before telling work but I don't think that is going to be a possibility. My husband is, as I write this, retrieving my maternity clothes from storage and I am looking forward to the comfy elastic waistbands. I am quite proud of the fact that I haven't gained much weight. By this stage in my last pregnancy, I had packed on 10 lbs. I am not proud of the fact that I haven't been exercising. It has been hot as balls here. At one point on Saturday, my car read 107!! So that's my excuse for outside, but there is no reason I can't be doing the prenatal yoga video inside. In other pregnancy news, yesterday we had an NT scan done. It is always nice to go to the perinatal center because they have awesome ultrasound machines with giant monitors on the wall. We got to see our little one sleeping. Not terribly exciting, and yet I could have watched for hours. We did have a brief scare, when the tech finally got the little bugger to move so that she could see its nuchal fold, it look huge (the nuchal fold that is). My heart sunk. She looked worried too. But a slightly different angle showed that in fact it was well within the desired range. In fact, our results came back really good...for a 38 year old and the perinatologist agreed with our decision to not undergo any invasive testing. So with that and coming to the end of the first trimester, we are just about ready to go public. I am nervous about that for some reason. I don't know why. Maybe because it will make it all really real. How can I miss you if you don’t go away? Former old-maid turned wife and mother. I work full-time and parent full-time. I am completely unartistic and have no attention to detail, yet i like to try to be crafty. Let's see what kind of damage I can do! Nice long update- with a suprise in the middle.